Chester A. Arthur became president after the assassination of President James Garfield. He was known for his platform of civil service reform and worked hard to overturn the negative opinion that was held of him at the beginning of his unexpected presidency. Arthur retired from politics after his first term. Toward the end of his presidency, he was diagnosed with Bright’s disease, a kidney ailment that caused his health to falter and his countenance to appear more aged. As the 1884 presidential nominations drew near, Arthur came to realize he didn’t have sufficient backing from his party; and while he continued to pursue Republican nomination, he did so halfheartedly. Arthur enrolled in Union College in 1845 and later pursued a law education. While in school, he was employed as a teacher and taught at various schools in New York and Vermont. He was admitted to the bar in 1854 and joined the firm in New York, where he had finished his law education. During his time at the law office, Arthur played a significant role in various civil rights cases, including representing Elizabeth Jennings Graham, an African-American woman who had been denied a streetcar seat because of her race. He won the case. In 1859, he married Ellen Herndon, and they had three children. It was during this time that Arthur began getting involved in politics. Arthur began his political career as chairman of the New York City Republican Party executive commission in 1868. During this time, he worked hard to raise money for the Republican Party, including for the election of Ulysses S. Grant to the presidency. In 1871, he was appointed collector of the port of New York. Arthur eventually found himself out of a job when he was fired from this position by President Rutherford B. Hayes during massive overhauls of the New York Custom House. However, in 1880, Arthur was nominated as the vice presidential candidate and soon found himself in the White House, first as vice president and then as president when Garfield was assassinated. During his presidency, Arthur signed the Pendleton Act into law, which protected government employee rights and also established written examinations for more competitive government positions. Additionally, he vetoed the Rivers and Harbors Act of 1882 and signed the Tariff Act of 1883. 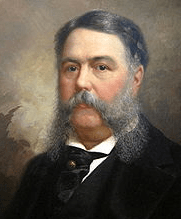 As with President Barack Obama more than a century later, Chester A. Arthur had to put up with accusations from his opponents that he was not a native-born U.S. citizen and therefore could not take office — in Arthur’s case, vice president. In fact, rumors were spread that Arthur was born in Ireland and came to America as a 14-year-old boy. These rumors more than likely stemmed from Arthur’s family constantly moving around during his youth. During his time as the collector of the Port of New York, Arthur was responsible for hiring workers to collect tariffs at the busy New York port. His income at this time skyrocketed, and he began to enjoy a more lavish lifestyle that, up until this time, he had been unaccustomed to. However, in 1874, this lifestyle came to an end after Congress made changes to the system of levied fines, which had afforded him the higher salary in the first place. In 1886, just a few years after his last day in office, Arthur died of the kidney disease from which he had suffered throughout his presidency.